Playing video games in HD resolution can be an amazing experience, but this comes with a catch. Your PC gaming system will need a powerful general processing unit (or GPU in short) to deliver such high visual performance. While most computers come with an integrated graphics card, onboard GPUs only handle a small amount of graphical tasks. In fact, some games won’t even load if your PC has an integrated low-end video card. 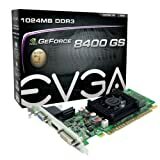 The good news is there are plenty of dedicated add-on cards on the market, which are designed to handle highly intensive graphics processing. When looking at PC graphics cards, you will find that most units are manufactured by AMD or Nvidia. These companies are the two main manufacturers dominating the computer GPU market. But, both manufacturers also supply customized graphics cards to licensed partners like EVGA, MSI, ASUS, and Gigabyte just to name a few brands. Graphics cards come in a wide range of price points. As with anything, the high-end models fetch higher prices because they tend to be faster and better in terms of performance. That being said, there are also budget video cards if you don’t plan to play video games at maxed out resolutions. Modern GPU chipsets have improved in leaps and bounds over the years. The most recent models come with their own memory (VRAM), stream processors, display ports and cooling fans. You can even find a wide range of graphics cards that allow you to play the latest 4K video games on PC. Since there are so many GPUs to choose from, picking one for upgrading or building your gaming PC can be a daunting task. To make things easier, this guide highlights the top 10 best graphics card for gaming. We have included everything from entry level and mid-range GPUs, to high-end graphics cards in order to suite every budget. So, without further ado, here are the best graphics cards for gaming. Which Gaming Graphics Card Should You Choose? 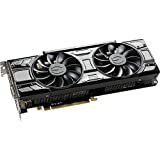 If you are looking for a graphics card under $100, then the EVGA GeForce GT 730 GDDR5 makes a good pick. 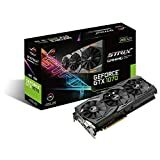 You get decent performance on a budget with this GPU. It is a 64bit video adapter and does not require a lot of power. In addition, it supports multiple output methods thanks to the inclusion of one DVI, HDMI and VGA port each. With the EVGA GeForce GTX 1060, it is possible to use monitors with 8K resolution. 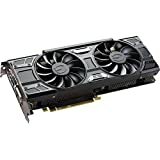 Therefore, if you are looking for a graphics card for playing very high definition games, this mid-range GPU is worth checking out. It is equipped with 6GB video RAM, two ACX 3.0 fan coolers and requires an 8-pin power connector. 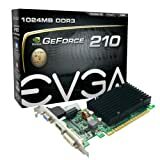 Budget graphics cards for gaming do not get any cheaper than the EVGA GeForce 210, which goes for less than $50. However, don’t expect high end video rendering at that entry level price point. With only 1GB internal memory and 1.2GHz clock speed, this GPU is suitable for light gaming. On the plus side, it can work with 30-inch monitors since the supported maximum resolution is 2560x1600pixels. This is another affordable gaming graphics card for those on a budget. With its 1920 x 1200pixel resolution, the EVGA GeForce 3400 GS 1GB supports up to 24-inch displays. 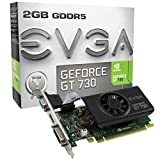 Like most Nvidia graphics cards, you get the choice of using a HDMI, VGA or DVI output port when connecting this GPU to your monitor. There is only one single back mounted fan on the graphic card for cooling. This display adapter will need your PC power supply to output at least 350Watts. The ASUS GeForce GTX 1070 is yet another GPU designed off the Pascal chipset architecture. If you want to play video games in 4K resolution, this 8GB V-RAM graphics card is the way to go. The program that comes with it allows you to manually overlock the GPU for greater customization. As for the cooling, there are 3 blowers mounted on the back. The great thing about this GPU is that it has patented Wing-Blade 0dB fans for reduced noise during intensive graphics processing. The EVGA GeForce GTX 1080 graphics card reserves up to 8GB video memory to deliver playable 4K frame rates. This Nvidia SLI ready GPU wields 2560 CUDA cores, 160 texture units and 8000MB of GDDR5X RAM on a 256bit bus. It is only rivaled only by the EVGA GeForce GTX 1080 Ti 11GB graphics card, which comes with better V-RAM and processing cores. Boasting a V-RAM of 11GB, the EVGA GeForce GTX1080 Ti is one of the most advanced graphics cards ever invented. Just like the coveted Pascal (Titan X) GPU architecture, this graphics card offers up to 3584 CUDA cores and 224 texture units. It’s much more affordable than the Titan X but you get to enjoy video games in 4K resolution from a single GPU. It might not be the fastest graphics card on the market, but the MSI Gaming GeForce GTX 1060 offers a modest 6GB video-RAM and support for 4K monitors. Its thermal compound housed in smooth heat pipes along with 2 fans onboard provide ample amount of cooling. The fan blades on this GPU are designed to last thanks to their double ball bearing design. You will also get 3 display ports along side one HDMI and DVI-D connector each. The EVGA GeForce GTX 1070 SC is one of the super clocked GPUs, which are factory tweaked to deliver better cooling. Much like the GTX 1080, this graphics card is based on Nvidia’s new Pascal chipset architecture. 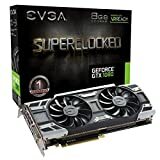 Although it is based on the same GP104 graphics card as the GTX 1080, the super clocked EVGA GeForce GTX 1070 video adapter only has 1920 CUDA cores instead of 2560. For adequate cooling, this display adapter also features the new ACX 3.0 double fans. 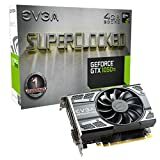 For those who want to enjoy low-cost 1080p gaming, the EVGA GeForce GTX 1050 Ti super clocked graphics card is one of the affordable options worth looking into. You can expect up to 4GB video memory from this GPU yet it supports displays that can playback in 4K resolution. This unit only features one fan and it is based on the Pascal chipset architecture as well. Knowing the best graphics card for gaming in 2018 is one thing, but selecting a video adapter that will work with your current gaming system is a whole ball game altogether.When choosing a gaming graphics card, there are several factors you should keep in mind. Most considerations revolve around the type of hardware that makes up your gaming PC. Take note of the length of each video card before making a purchase by measuring the slot it will go into and be making sure that there is enough room in your PC case to house it. On average, most add-on display adapters measure 10-inches long, although there are some models with triple fan coolers that can reach up to 12.5-inches in length. Secondly, check whether your monitor’s resolution matches up to what is listed in the graphics adapter specs. The best way to know which type of monitor to use is by checking the hardware requirements of the software you want to run. Most games specify the minimum screen resolution required for seamless video rendering. Thirdly, the power rating of the GPU you choose also matters. Ideally, the wattage rating on your power supply unit should be able to support both the load used by your computer and graphics card. A power supply that does not measure up will cause your PC to either shutdown when games load or it won’t boot at all. In addition, your power supply should have enough 8-pin or 6-pin connectors for your GPU. Power rating on graphics cards is usually indicated beside the abbreviation TDP. Gaming performance on a PC depends heavily on the graphics card, but the rest of the system is a factor too. As a general rule of thumb, your PC should have at least twice as much memory as your video adapter. That means a GPU with 2GB VRAM will perform best with a PC that has 4GB RAM. You also don’t want to pair up a powerful graphics card with a slow processor. The new core i5 and core i7 CPUs are a perfect fit for gaming. Finally, make sure that the drivers for your chosen display adapter are compatible with the operating system installed on your PC. Older operating system versions might not support newer graphic card drivers. Remember, buying a video card requires thoughtful consideration. To find the perfect fit, do homework by double-checking GPU specs and reading buyer reviews.